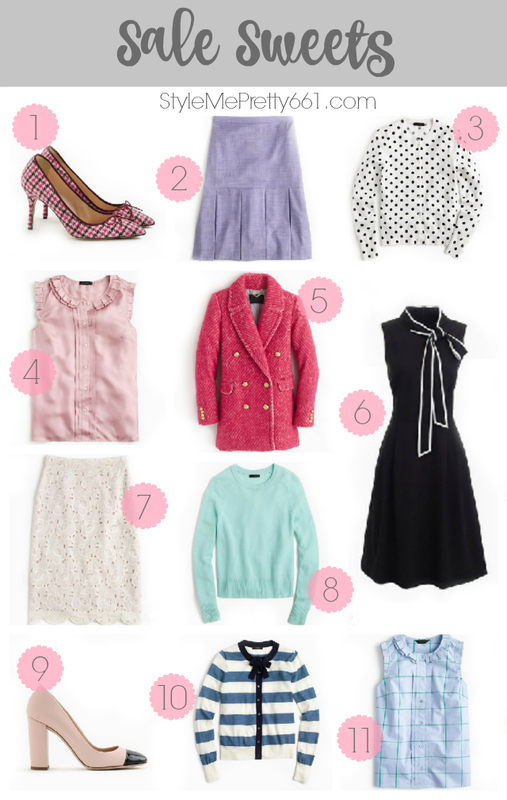 Candy colors, stripes, bows, polka dots...you already know I'm salivating over these sale sweets from J.Crew! As anyone who knows me will tell you, I've always been a longtime fan of J.Crew. These past few seasons in particular, though, they've really been blowing me away with their gorgeous selections! I constantly find myself browsing all of their yummy colors and ogling over all the delicate ruffles, lace, and bow details. The recent style offerings just keep getting better and better, and my feminine-style-loving heart couldn't be happier! I've rounded up several of my recent cravings -- all of which are on major sale. I think of all the Presidents' Day Sales going on this weekend, this is the one to really peruse and take advantage of, especially since several iconic pieces are included, which is rare. Hint: Lady Day coats, anyone? Which ones are your personal favorites? If any of these have been on your wishlist, now is the time to grab them, especially with Winter stock being cleared out to make way for fresh Spring/Summer stock. For example, the Lady Day Coats are now less than $200 (most colors), the Chateau Parka is now less than $200, and the Icon Trench Coat in Italian Wool Cashmere is now only $130! As any J.Crew loyalist will tell you, these are exceptional values for classic, high-quality coats that normally retail for upwards of $400! They will last for years, too, making them a great, long-term investment. Happy browsing/shopping, and I hope you enjoy the nice, long, holiday weekend!